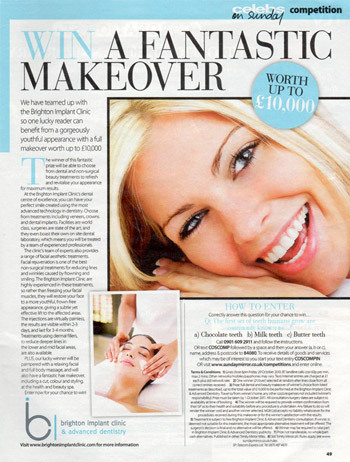 Brighton Implant Clinic Makeover Competition! Brighton Implant Clinic offers regular competition for those wanting to have dental implant treatment but are unable to afford it. Dental implants have helped many regain their confidence after losing teeth. Dental implants offer a fixed solution to missing teeth. Dental implants are placed in a short procedure which usually lasts less than one hour and many treatments can be carried out in just one day. For more information about Makeover Contact Brighton Implant Clinic or Call us on 0800 111 6623.